Tuesday was squadron day off, and I did some washing in the a.m., and set up a plot for a story. Was putting the finishing touches on it when we were called out to finish our secret mission. We ate chow at the gunners mess while the pilots ate at El Rancho Grande, the pilots mess. When we finished eating, we returned to our plane and awaited developments. The pilots went to briefing after chow and gave us the story on return to their ships. We were to set up a diverting action while TBFs mined Buka Passage for subs that were coming in there.3 Accordingly, we took off after the weather had cleared sufficiently. Our plane was last to leave the ground and we circled until we found the blinking green light that signaled our element leader’s ship. We fell in on his right wing. Fifteen strong, we soared over the ocean to the west of Bougainville. 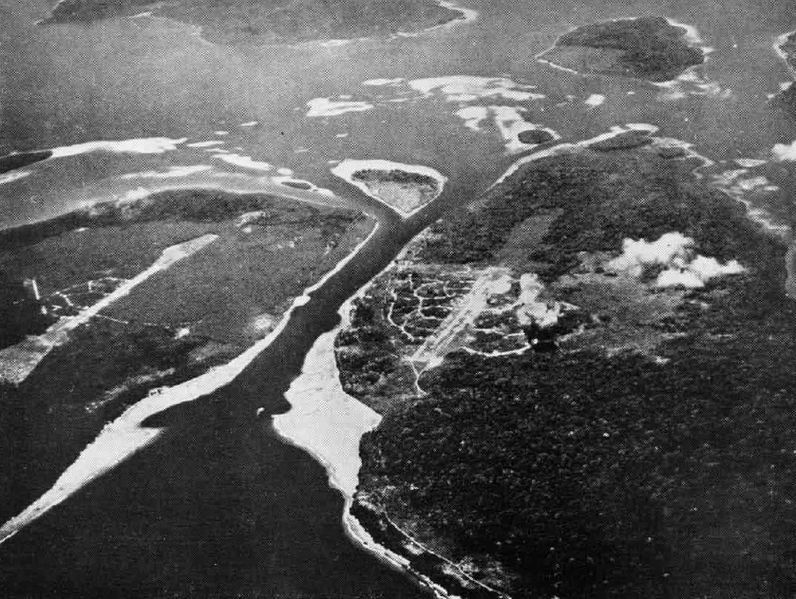 Buka Passage between Bougainville (left) and Buka (right) islands in 1943. Two Japanese airfields are visible, Buka airfield (center) and Bonis airfield (left). The view is from east to west. The Japs were caught with their pants down and didn’t fire a shot that I could see.6 Heaven help the subs that inch into that waterway. They become deader than a dead mackerel. The night was softly lovely. Each mountain and hill stood sentinel, stretching their bulk into the sky. So brilliant was the moon that Bougainville volcano showed its smoky maw with sleeping fires smoking into the blue. A long roll of steamy vapor lay along the calm sky. So breathtakingly beautiful in the night and so sloppy slumberous green, sticky with life in the bright light of day. After our attack, we crossed Bougainville and stretched to Stirling fighting sharp squalls of rain and mist drenched sky, dodging the blackish coils of deep purple storm clouds. We landed just in time. No sooner had we taxied to our revetment than the rain burst. We were enroute to operations in a minute and then the open truck stalled. So we sat and cussed and were soaked to the gills. After a long day, we were nearly as scaly as a fish anyhow. At any rate we reported our results to intelligence and raced to the mess hall. Ate four delicious fried eggs, two slices of cake and an enormous cup of coffee. Very good, and so to bed. 4 Wayne reported that they “took off after the weather had cleared sufficiently.” More than likely, they took off after the moon had sufficiently risen to provide illumination for a successful mission. The twelve B-25s and three Navy TBFs taking part in this raid did so under a brilliant full moon. Wayne reported that their attack was conducted at “minimum altitude”. Brilliant moonlight may have been the key to this low-level mission with the three TBFs flying down the center of the two-thirds of a mile-wide and nearly three miles long Buka Passage with six B-25s flying on either side of them. The YouTube video at http://www.youtube.com/watch?v=pVQx9OUcXYo provides some sense of what Buka Passage might have looked like in 1944 from a B-25. 5 It was indeed a secret mission, as Wayne noted in the first paragraph of today’s entry. The mission was reported officially as follows: “12 B-25s bomb Bonis Airfield and nearby targets of opportunity in Buka Passage.” The three Navy TBFs which laid magnetic mines in Buka Passage are not mentioned as this chronology is solely that of the Thirteenth Air Force. “Tuesday, 9 May 1944, South Pacific Area (Thirteenth Air Force)”, Combat Chronology of the US Army Air Forces May 1944. database (http://paul.rutgers.edu/~mcgrew/wwii/usaf/html/May.44.html : accessed 04 May 1944). May 9 – Fifteen Mitchells launched a minimum altitude night attac k on various objectives in the vicinity of Buka Passage. Attacks were by elements of three planes and were designed as diversionary efforts to support other activities in the area. 182 centuries were dropped. This hazardous mission was accomplished without loss or injury to personnel or equipment and earned a “well done” dispatch from Comairsols. Two night attacks (See May 9 and 10) executed during the month caused a break from the routine daily medium altitude strikes. The low altitude attack staged in the early evening of May 9 was outstanding. Designed as part of a coordinated action its purpose was to serve as a diversion for other activities in the area. Its success depended upon split second timing, precise execution according t plan and withdrawal along an exact route which would preclude the possibility of collision with other aircraft. The complete success in each phase was a compliment to the officers of all organizations participating who had a part in preparing the Operations plan. Periodic Activities Summary, 1 May 1944 – 31 May 1944, Headquarters 42nd Bombardment Group (M), 1 June 1944, microfilm B0131, Maxwell AFB, AL: Air Force Historical Research Agency, 1973, frames 1618 & 1622. This entry was posted in Uncategorized and tagged Bougainville Island, Buka Passage, cake, coffee, eggs, El Rancho Grande, magnetic mines, mines, moonlight, Stirling Island, submarine, TBF, Torokina Airfield. Bookmark the permalink. This continues to be an amazing story. The language and the descriptions are so clear and articulate. The notes and commentary add a lot to the adventure. As always, thanks again. I did view the video; it is always fascinating to see these airstrips peppered about the SWP are still in use. Some of the ones on Green Island are still used today.